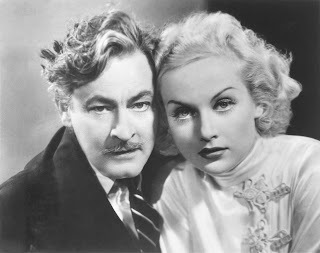 Oscar Jaffe (John Barrymore) is the great man of Broadway, the producer of numberless hits, who runs his theatre like a prince does his realm. His latest discovery - and paramour - is Lily Garland (Carole Lombard), whom he transformed from a lingerie model into a star. Driven to distraction by Jaffe’s egomania, she flees to Hollywood, where she becomes equally successful in motion pictures. Now, Jaffe needs a hit, he needs inspiration, he needs Lily - but there is no way she will ever return, willingly, to his embrace. But, as always, Oscar Jaffe intends to have his way. This first of the screwball comedies has an impressive parentage. Not only is the leading man one of the great actors of early movies, a rarity who made the transition from silent films to talkies, and the leading lady one of the lights of 1930s comedy, but the writers are the winning team of Ben Hecht and Charles MacArthur, with uncredited contributions by Preston Sturges. This noted, Twentieth Century is not up to later entries in this genre, such as His Girl Friday. 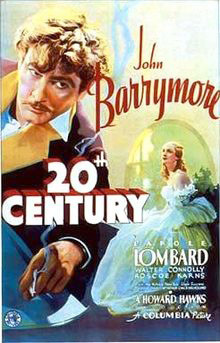 Like the latter, Twentieth Century came from a play (by Charles Bruce Millholland), and shows its origins a bit more. It is almost as if those who would go on, not to better things but more precise things, were honing their skills here. But good Hecht/MacArthur and good Hawks is better than the best from many others, and Twentieth Century is fun entertainment. At its centre is Barrymore’s Oscar Jaffe. To write that he has a bit of an ego is similar to saying that Hitler liked things ‘just so’. His claim, made before each production, that he loves all his actors, is then followed by a demonstration of how much more he loves himself. Jaffe, in fact, holds actors in pitiful contempt, but his entire behaviour is based on the most exaggerated performances one can see on stage. Barrymore must have had a break-down after the demands of this role, in which everything is over the top. Lombard matches him, though her histrionics come later, after she is an established diva, with an ego of her own. There is a scene in which both are collapsed in chairs wailing about their respective lots in life; they resemble a couple of escapees from a lunatic asylum. The writing is sharp, as may be expected from Hecht and MacArthur, and utilises a number of innuendo which had to be used because of the censorship of the times. Personally, I find that such restrictions helped good writers: when one has fewer tools with which to work, one must become skilled at one’s trade. I’ve always preferred the implicit to the explicit in film scripts, anyway. Twentieth Century won’t be for all twenty-first century tastes, but for those who like their comedy frantic, and a little different than that of today, this vintage film has aged very well. Regarding the "censorship of the times"--Florence King had the perfect line that always reminds me why I prefer to watch old movies: "The popularity of old black-and-white movies may be due less to a chi-chi interest in 'film history' than to the reason that dare not speak its name: the relief of knowing that the movie we are about to see was strictly censored." Yeah. I'm an old prude, and damned proud of it. The more I learn of Ms King (such as the fact that she was a monarchist), the more I admire her.